Comfortable and adjustable fit provided with an elasticated, draw cord and belt looped waist. Hand warming and secure storage supplied through two external hip pockets. Full weather protection, but with easy and rapid temperature adjustment provided by the 3/4 length side zips with internal poppered storm baffles. Can also be pulled on over walking boots. Quick and efficient changing from Trousers to Shorts and visa versa. Paramo says:"The complete solution to every backpacker's and hill walker's needs! Designed to be worn throughout your trip, our Viento Zip-off Trousers provide comfort and function in every climate. From hot days to freezing nights and precipitation in every form, the Viento Zip-offs are the most versatile and innovative legwear on the market. Paramo's latest Directional Waterproof legwear provides full weather protection and can be easily and safely converted to shorts on the move.."
The fabric in the Paramo Viento zip-off trousers comprises two layers and is very soft to the touch, warm and lightweight. Both waterproofness and Breathability were excellent. They're are warm enough to be worn next to the skin even in deep winter conditions without the need for over (or under) trousers. I was able to control the temperature via 3/4 length zips running from thigh to ankle. These zips are poppered and baffled and offered good protection from rain and wind. For ultimate cooling the trousers convert to shorts. This was both quick and efficient whether converting from trousers to shorts or vice-versa. The 'legs' have colour coded tabs and the zips located easily for quick conversion in worsening conditions with no need to remove any footwear. There's even a small bag provided for 'leg' stowage. There are two front pockets that provide storage and hand warming options. However, since both are located in the outer fabric, neither or them was fully waterproof. Fit was good - there's elasticated ankles and waist plus a fully adjustable belt. The articulated knee design was really useful when scrambling or climbing stiles. Soft, comfortable and warm plus a high level of technical performance - if you walk regularly all year round in Britain - Paramo Viento Zip-Off's are a good investment. Extremely soft and comfortable lightweight fabric that deals with perspiration and wind and rain in equal measure. 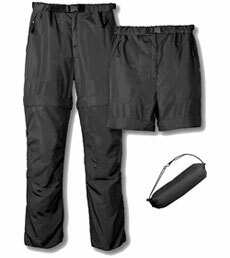 For 95% of the year the Paramo Viento Zip-Off trousers will be the only walking trousers you will need.